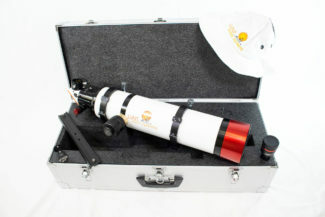 The Lunt LS100THa solar telescope is a complete solar telescope. 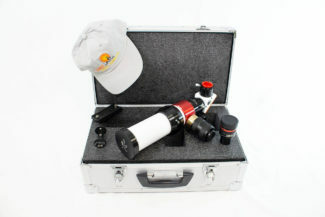 This refractor-based system has a precision-aligned doublet ED lens with a 102 mm aperture. Furthermore, the focal length is 714 mm, for an f/ratio of 7. Additionally, the course focus adjustment is made via a slide tube. While focusing is achieved with a high precision 2″ Starlight Feather Touch focuser with 10:1 reduction as standard equipment. Most importantly, an internal etalon with tune adjustment allows for a <0.7 Angstrom bandpass. Have been using this scope for over a year. Totally tricked out with the FT focuser, B1800 BF, and DSII module. minimum size required to see spicules (fuzz around the suns edge). Do yourself a favour and hang a binoviewer off it. I do and to be honest I could sit and stare at the sun all day! Pressure tuning, yes that’s the only way to fly! This scope is a keeper, forever. Thanks Lunt! My first Lunt product was the LS35THa/B600 Deluxe – I was and still am impressed with the views and craftsmanship of this instrument -looking forward to viewing our nearest star with this upgrade in aperture and the pressure tuning system – this instrument is also machined beautifully – will be placing a order shortly to get on the waiting list for the double stack filter that goes with this unit – Thank you Lunt Solar Systems! LS100THa/B1200 Very happy to have bought it way back in March 2011. Everything that you promised and more!